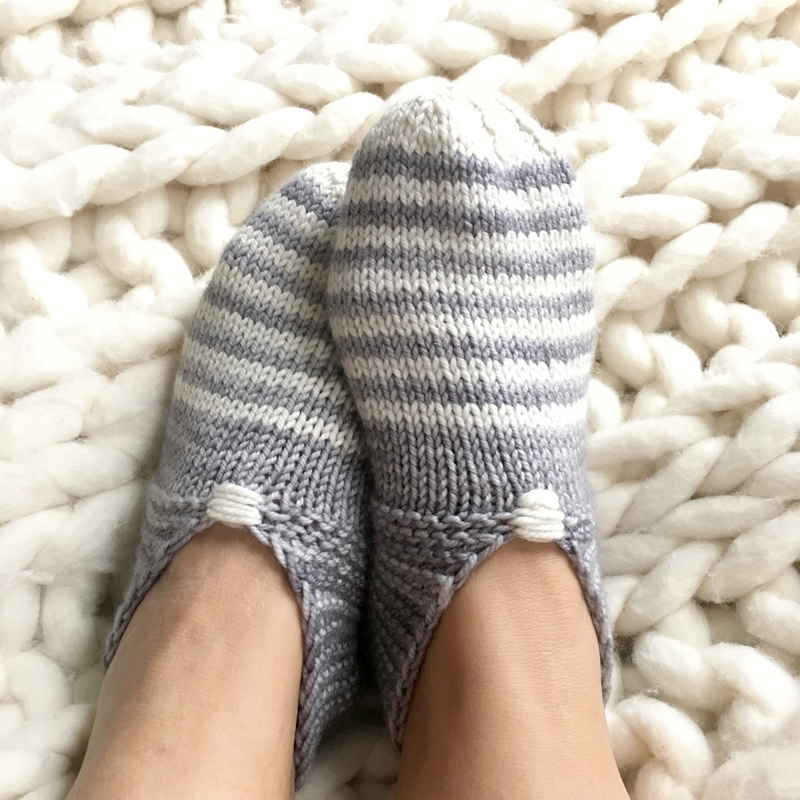 These Simple House Slippers by Simone Alexandra are as easy to wear as they are to knit. The pattern is knit flat at the back (garter stitch) and then in the round for the rest of the foot (stockinette). 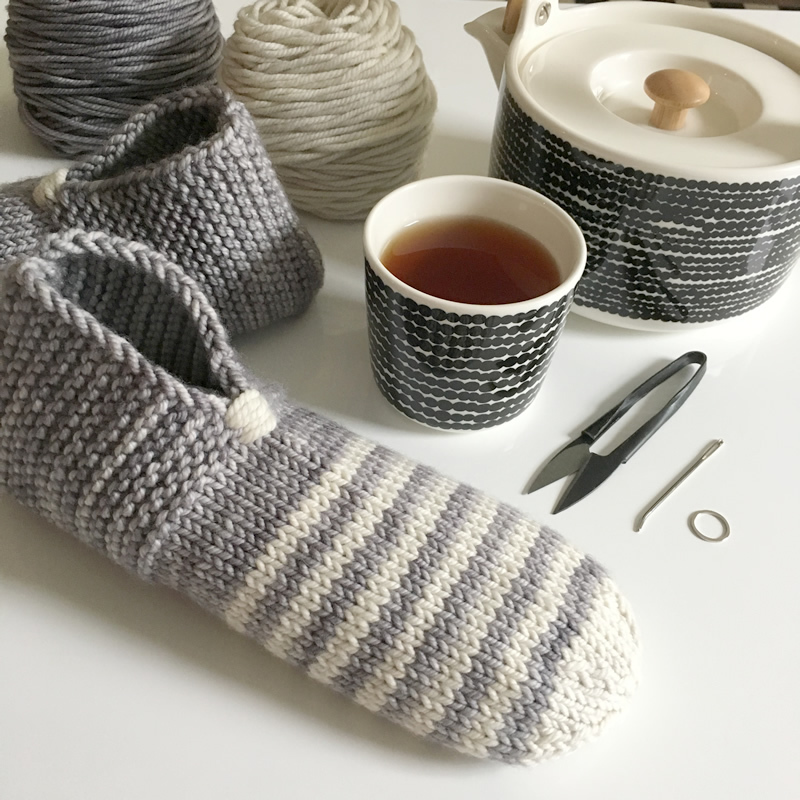 The toe has a very rounded shape like the top of mittens making these look and feel more like real slippers than house socks. Cozy and classic. Start now and knit a bunch of these in time for holiday gift-giving (yes, I really said that – it’s never too soon to get started)! Suitable for beginners as well as more advanced knitters looking for an in-between project. One size fits most (easily adjustable). I knit this pair last Saturday with Madelinetosh Tosh Chunky and have been wearing them at home ever since! Quick, easy, and oh, so satisfying. Just added to our webstore: Books & Mags! Join us for a Pure Joy Knit Along! The pattern calls for DK weight yarn and I noticed that you used chunky weight. Was there an adjustment in the number of stitches? No, I just knit the pattern as written. I thought a denser fabric for slippers would be a good idea. I 4.5 mm needles. Note that Tosh Chunky is more of a heavy worsted / aran weight (16 – 18 sts / 4 “) than a true chunky (14 sts / 4”). HOW CAN I DOWNLOAD THIS PATTERN ? Thank you for your interest in this pattern. Since this is not one of ours, you’ll have to sign in to ravelry and download it from there. If you have not signed up yet for ravelry.com, I do highly recommend it – we find so many lovely patterns there, more than we’ll ever be able to knit! I am sure you will get lots of inspiration from it, too. Thank you so much for the beautiful patterns.